This weekend I celebrated Susan as we reached another one of her birthdays since her passing 2yrs ago. I wanted to get outside and try to enjoy life a little while remembering her. It is still hard at times but, life moves on. I’m also trying to not make excuses for missing out on rides with friends. In the year after her passing, it was easy for me to make excuses for traffic or something else. 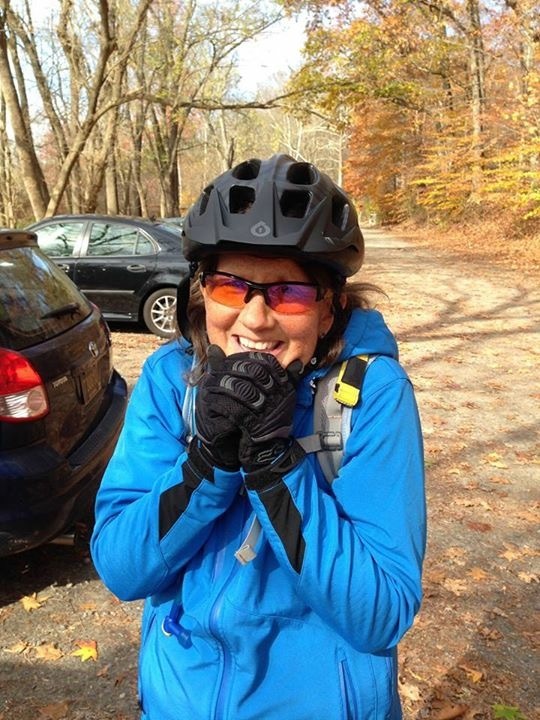 Susan after a day of riding at Brandywine! Friday I took off of work to ride with my buddy Brice at Brandywine Creek State Park. Susan and I visited this park more than a few times in the past. Brice, and is wife Megan, just bought a new house in Wilmington, DE so now they are closer to the trails at Brandywine. I met him at his new house, got a tour and then rode to the trails. Brice, whether intentional or not, made sure I had a good time. I really appreciate that buddy! Sunday, I headed back up there to join Brice and our friend Matt Miller, who is home from New Zealand visiting family for a couple of weeks. Matt is also who I get my training plans from. We had a great day of stories, laughs and riding. It was great to catch up with Matt and hear the bits of an accent creep in through that classic NZ colloquializm he’s been around the past 4 years. It’s amazing how your perspective changes after losing your wife. I no longer care if I’m in bumper to bumper traffic. I just try to plan ahead for it and focus on where I’m headed. The time spent with friends. This is how Susan lived her life, she didn’t sweat the small stuff. Life is short. I really miss her and am not afraid to admit that it’s easy to get misty-eyed when I write like this. She was an amazing person and partner. When I look at photos of her, I still can not believe that she is gone. I’m moving forward and am hopeful that I can sell our house in the near future. It’s difficult to live in “our home.” I know that once I put the sale of the house behind me, I will close that chapter of our life together. I look forward to brighter days and my new life.